Who is Cosmic Spider-Man (Earth 13)? 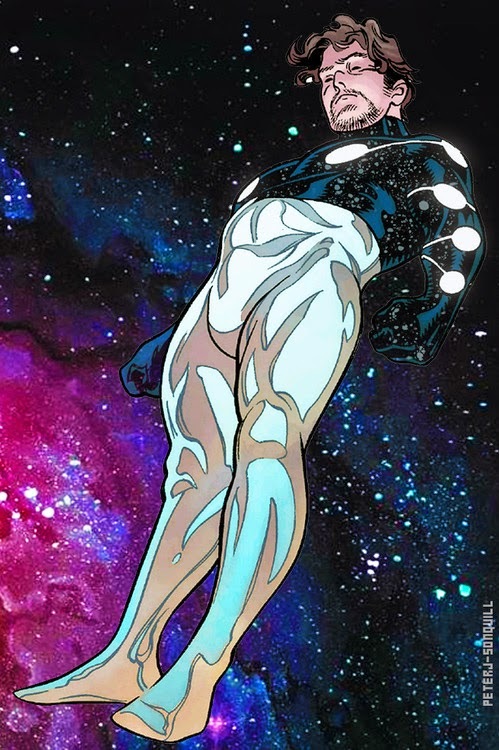 Cosmic Spider-Man of Earth 13 is a version of Spider-Man who never gave the Enigma Force. The Enigma Force was a set of powers that Spider-Man briefly had that gave him near god like force. Bio: It is not clear when this Spider-Man gained the Enigma Force or why he decided to keep it. He does tweak Parkers line to be, "With Ultimate Power comes Ultimate Responsibility." Cosmic Spider-Man provides a safe haven for the Spider-Man's to use as a HQ. If he leaves his universe he loses his powers but within his universe he hopes to keep the Spiders safe. He specifically looks after Benji Parker the baby son of Peter Parker and Mary Jane in one of the universes. In making his universe a safe haven it becomes a target for the Inheritors. Despite, his great power he is killed by the father of the Inheritors Solus. Solus eats power and seems to have no limit at doing this. Cosmic Spider-Man has the powers of 616 Spider-Man as well as the Enigma Force. The Enigma Force gives Spider-Man near god-like energy powers. Cosmic Spider-Man is killed by Solus the father of the Inheritors. Solus's appetite for energy is without limit and simply inhales Cosmic Spider-Man.